Most of us know how important conversion rate optimization (CRO) is to our bottom line. Fortunately, CRO is a revenue driver, and it can have a positive impact on your business at every point in the funnel. But we also know that an effective CRO campaign requires an investment of time—and money. And it can be challenging to get support for spend on a process or strategy when your executive team doesn’t understand its value. The good news is that conversion rate optimization is all about dollars and cents—a language your CFO speaks very well. You know CRO can increase your bottom line. The challenge is to show your executive team that the end result is worth the resources needed to accomplish the goal. Bring an implementation plan to the table (complete with a budget), and you’ll find it easy to convince the higher-ups that CRO is worth the ROI. 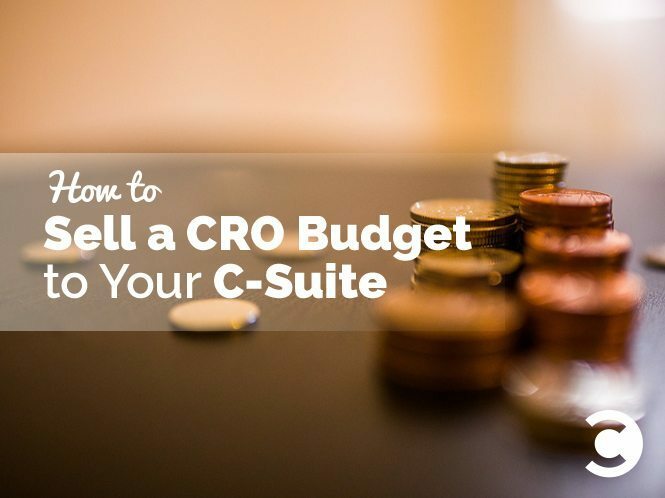 Here are four tips to help you build a budget that sells CRO to your C-suite. Calculating lead value will help your company avoid over- or under-spending on CRO. If you know an average lead is worth $20, you can steer clear of a $40-per-click ad campaign that won’t reap a good return on investment. Once you determine your lead value, it’s easier to inform purchasing decisions, too, like deciding if software is worth the investment. If a new form building platform or page testing tool costs less than the amount of valuable leads it can generate, you can confidently take the plunge. In fact, you may find that CRO increases your average sales value, which in turn will boost your average lead value. So why is it so important to quantify the cost of a single lead? Because as marketers, we want to optimize for revenue, not just conversions. If your average lead value is $4, and you’re generating 1,000 new leads a month, you know you can safely invest $4,000 in CRO infrastructure, tools, and talent. When your lead value increases, so can your CRO budget. Optionally, you can take this a step further and calculate your lead value for each key traffic source. That way, you’ll know if certain channels, such as search or social ads, offer the most revenue potential. In marketing, as in anything else, the grander your goals, the bigger your budget. Conversion goals should always circle back to meaningful, profitable returns for your company. In some cases, you may be surprised to discover that a decrease in conversion rates can lead to an increase in sales. For example, you may choose to test out a price jump on a pay-per-click landing page. If you’re optimizing for a target niche, you’ll know what incentives (like free shipping or bonus features) to include along with an increase from, say, $40 to $75. For every 100 people that convert in this example, you’d make $7,500 instead of $4,000. So even if your conversion rate drops from 5% to 3%, you still get greater lead value with a pricing structure optimized to appeal to your target niche. You could then go on to test additional, highly targeted optimizations to boost the new conversion rate. Are you using a form builder to collect email opt-ins? Integrate it with your Google Analytics and start A/B testing form fields. Have in-house copywriters? Get them involved. In your budget, scope out the projected use of tools and talents already at your disposal to show your leadership ways you plan to maximize current resources. Most vendors offer free trials of anywhere from 7 to 30 days. Try out different options, ask for one-on-one demos, and compare features before you start paying for software. This will allow you to budget accordingly. Want to take a deeper dive into budgeting for CRO? Check out this new fill-in-the-blank e-book to learn more.